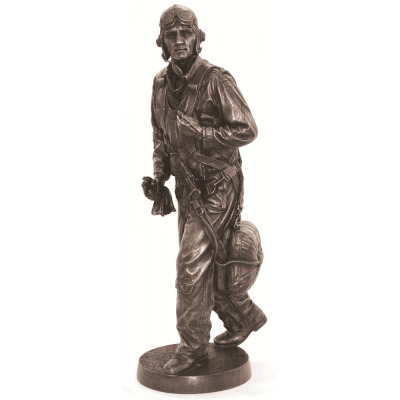 Pilot Sculptures: This limited edition pilot statue is called Flyboy and is fashioned after a U.S. Navy World War II pilot. The collectible statue, which displays authentic detail, is a great gift for a pilot, aviation enthusiast, or collector. Nancy’s Notes: When I first saw this pilot sculpture I was immediately impressed. What caught my eye was the historically accurate, and realistic detail of the pilot’s flight gear. The pilot is shown wearing, an M-450 cotton helmet, AN-6530 goggles, summer weight flight suit, a B-3 Mae West, and a QAS parachute. This was all gear really used in the Pacific Theatre. Our high quality statue is certainly a fantastic tribute to the heroes of World War II. The pilot sculpture is formed using a bronze cold cast resin technique. 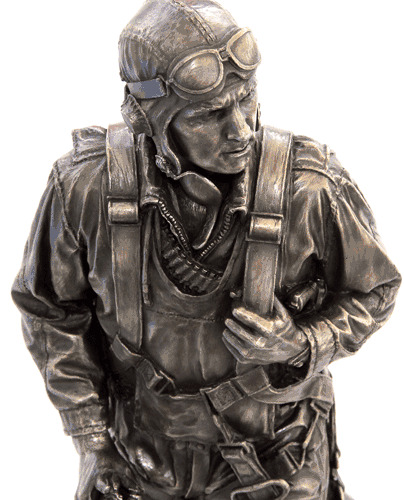 This means that the resin sculpture is bonded with real bronze giving the pilot figure a look of a solid bronze statue without the high cost. The hand finished exterior will age and slightly darken over time. Each Flyboy statue is serial numbered, and is part of the 2,000 unit limited edition. Please be aware the chin strap is missing on remaining sculptures.